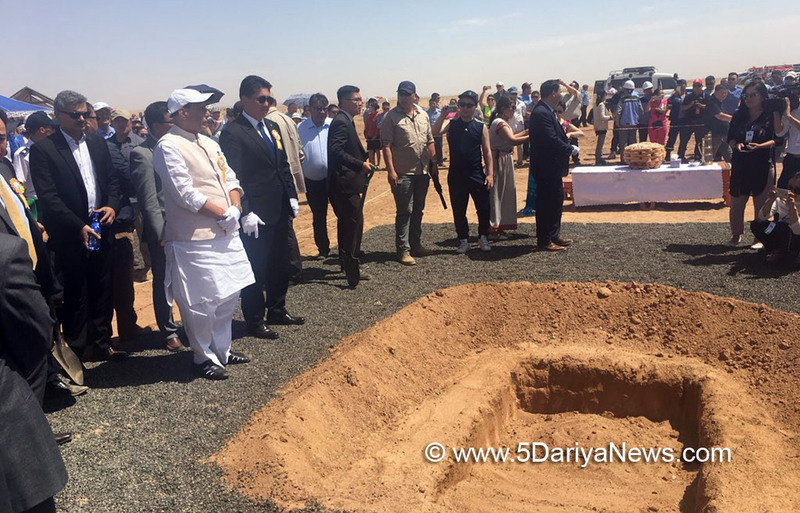 During the Ground Breaking Ceremony for the Oil Refinery at 'Stantsiin Hooloi' in Altanshiree Soum, Mongolia today, the Union Home Minister Shri Rajnath Singh observed that this Ceremony was an important milestone in the bilateral ties between India and Mongolia. The Prime Minister of Mongolia, Mr. Ukhnaagin Khurelsukh and other dignitaries were present.The Home Minister while recalling the statement made by the Prime Minister Shri Narendra Modi during his historical visit to Mongolia in 2015 where he had announced Line of Credit of US$ 1 billion for this project, expressed confidence that with the start of this refinery, Mongolia would derive rich benefits. Shri Rajnath Singh was of the opinion that this will further strengthen the relationship between both the countries and averred that it was India which first established Diplomatic relations with Mongolia after it came out of Communist Bloc.The Home Minister lauded the efforts made by His Holiness Kushak Bakula, who during his life called upon the youth to lead life with human values. He himself, the Home Minister observed, was a symbol of peace and love.Shri Rajnath Singh further stated that both India and Mongolia should work in close coordination not only for progress and development of Asia but to usher peace and prosperity in the Indo-Pacific region.Home Minister is on a 3-day visit to Mongolia to further strengthen India’s relations with Mongolia and security cooperation. Mongolia is seen as an important strategic partner of India and New Delhi wants to realise the huge potential of bilateral relations with Mongolia.